I like how the New Living Translation says it even better: "A cheerful heart is good medicine, but a broken spirit saps a person’s strength." Did you know that some health centers treat patients who suffer from depression, stress and diabetes with "laughter therapy?" I read a report that claims laughter therapy cuts health care costs, burns calories, helps arteries, and boosts blood flow. Laughter is one of my personal favorite gifts from God. I fell in love with Jesus Christ 30-plus years ago, and since then I’ve spent most of that time serving in Christian ministry. In my travels through church hallways, staff meetings, and storage closets, on mission fields, in sanctuaries, and at prayer altars, I’ve seen that most of us come to the Lord broken and rough around the edges. Ministry life can be extremely challenging, but it's also remarkably rewarding. Laughter, I've learned, is one of life's greatest rewards, reviving and carrying me through the daily challenges. If you suspect you might be suffering from a lack of cheer, let me encourage you to look for ways to laugh more! 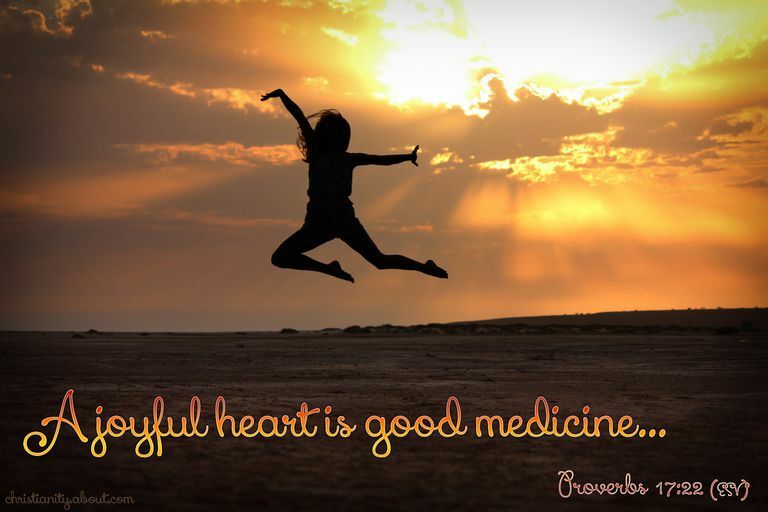 It might be just what the Great Physician has prescribed to improve your health and bring joy back into your life.